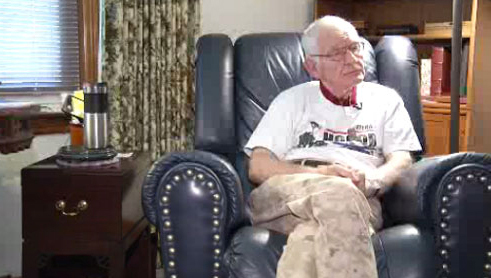 Bob Walz, who attends Grace Polaris in Columbus, Ohio, participated in five major battles during World War II. Bob Walz, who attends Grace Polaris, the Grace Brethren church in Columbus, Ohio (Mike Yoder, lead pastor), was recently featured in a story about D-Day. A portion of the story appears below. Click here to read the complete story and view the video, which was broadcast on NBC Channel 4 in Columbus. On the 69th anniversary of D-Day, the number of living veterans who fought in Normandy is dwindling. But for one Central Ohio man who experienced it all, the memories haven’t faded. “The more I heard, the more dedicated I became to do whatever I could do,” said WWII veteran Bob Walz. Drafted in July 1942, at the age of 19, the Newark native fought in one historic battle after another. Among others, Walz fought on the day the Allies invaded Europe in World War II, which occurred 69 years ago on June 6, 1944. But at 90 years old, Walz doesn’t think of himself as a hero. Instead, he said the focus needs to stay on those who lost their lives. Click here to read the complete story and view the video, which was broadcast on NBC Channel 4 in Columbus.